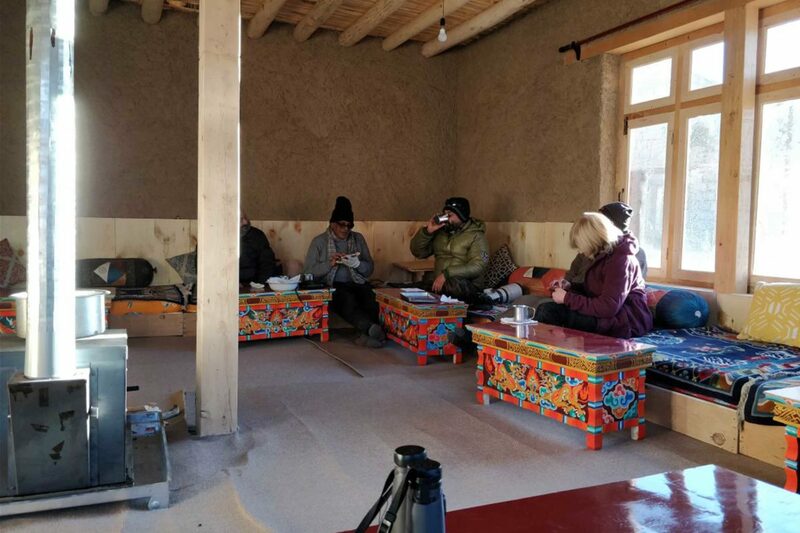 A newly developed local homestay providing heated rooms, western style toilets, home-cooked food and the opportunity to meet some of Ladakh’s fascinating and friendly people. 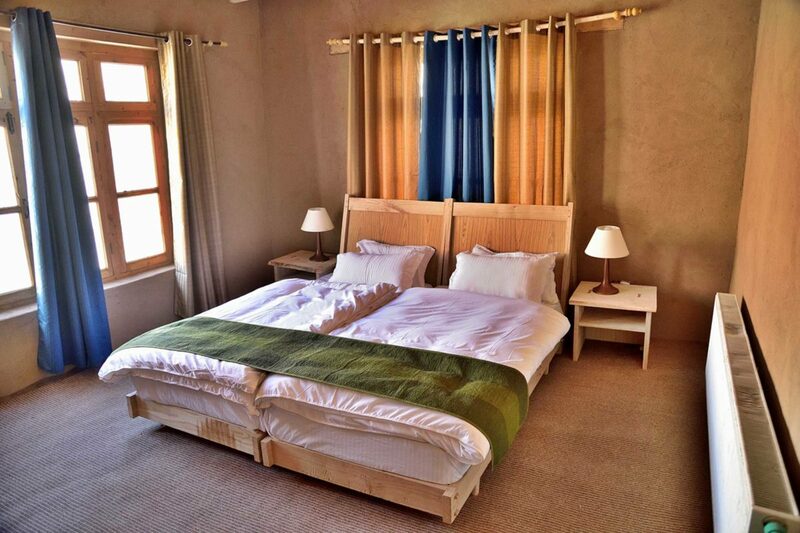 Accommodation is in a traditional mud and stone building with flat roof and communal living quarters. 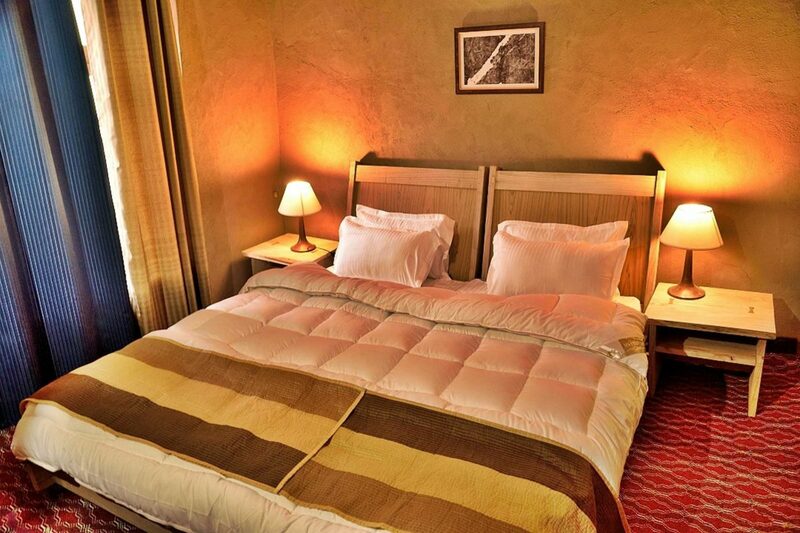 Each guest will be allocated one of the 5 simple private rooms within. 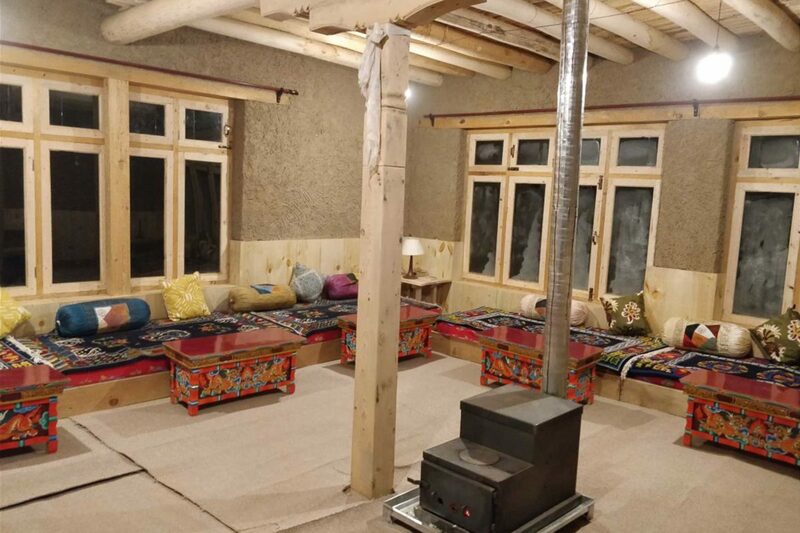 The rooms are carpeted and feature mattresses with thick Ladakhi blankets, pillows and the building has both Kerosene heaters and limited central heating. Please note that the central heating is only on for an hour or so in the evening after which hot water bottles and gas heaters are provided. There are two simple shared western style toilets. Please note that a sleeping bag is also still recommended to provide extra comfort. Meals will be taken in the communal dining and living room of the house and will feature local home cooked food such as rice and lentils, vegetables, chicken, eggs, dumplings, and soup. Hot tea, coffee and water is always available and hot water bowls for washing or brushing teeth can be provided on request. Communal living/dining room in which all guests join for dinner. There are two shared toilets with simple flush systems and a western toilet seat provided. 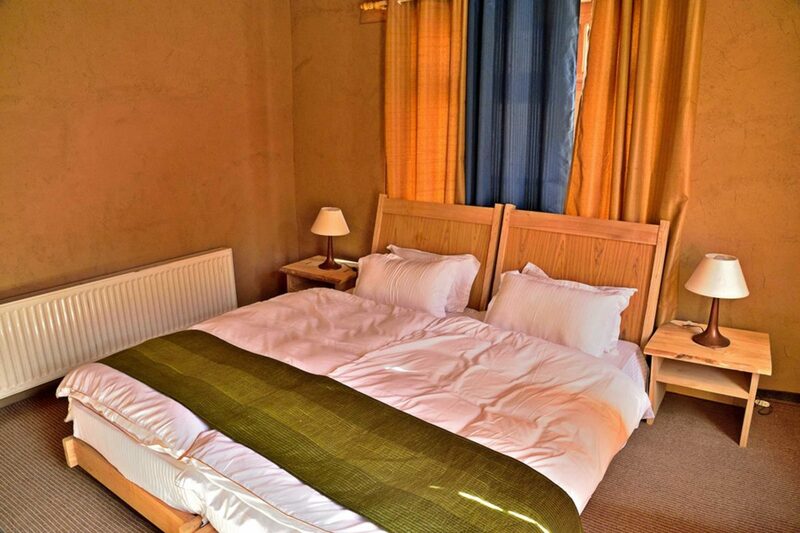 Guests are allocated one of the five private bedrooms each with a raised bed and lighting, a space for luggage and a gas heater and limited central heating. There are no showers but bowls of hot water are provided for washing. 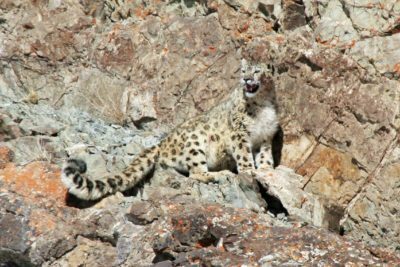 Several snow leopard territories in the area, plus packs of Tibetan wolf, Ladakh urial, Asiastic ibex and red fox. 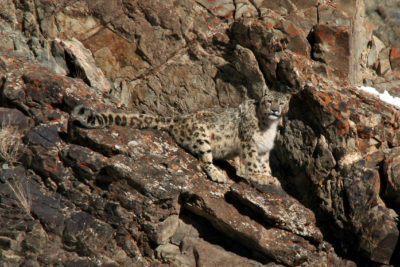 The birdlife includes lammergier, golden eagle, robin accentor, chukar partridge, Tibetan partridge and Himayalan snowcock. 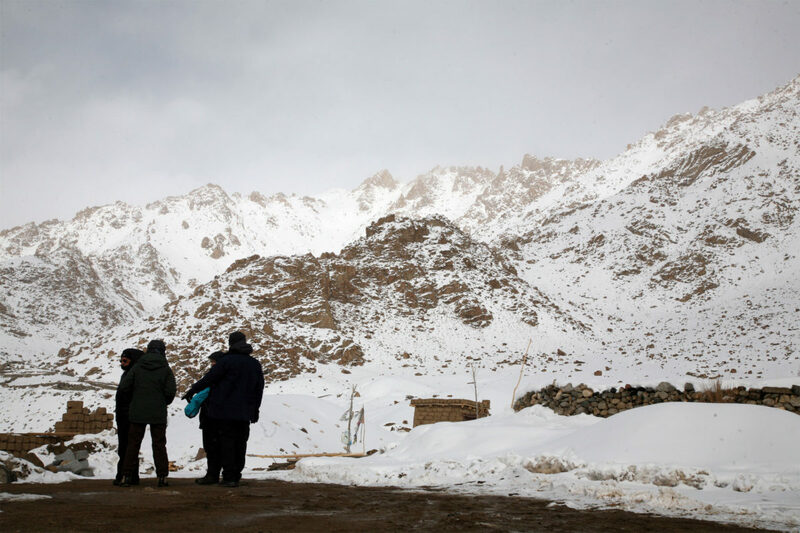 Although thick Ladakhi blankets are provided, a sleeping bag is also recommended to provide extra warmth and comfort against the cold. Disposal hand warmers are also useful. Everything ran like clockwork. Everyone we dealt with was friendly and very helpful. 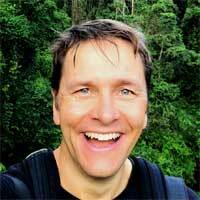 Transfers, guides and wildlife sightings all exceeded our expectations. Highlights were having a male tiger with his mouth and legs covered in blood following our jeep a long the track in Tadoba and seeing a leopard lounging on a rock by the roadside.